This page is a growing list of links for museums and historic sites in New York State. Adirondack Museum (Blue Mountain Lake, NY) - dedicated to the history, culture, and art of the Adirondacks. Albany Institute of History and Art (Albany, NY) - dedicated to collecting, preserving, interpreting and promoting interest in the history, art and culture of Albany and the upper Hudson Valley region. 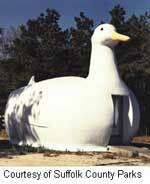 Big Duck (Flanders, NY) - open to the public as a museum shop and a tourist information center. Boswell Museum (East Springfield, NY) - exhibits on jazz music. Brooklyn Children's Museum (Brooklyn, NY) - has programs and exhibits based on a remarkable collection of 20,000 cultural artifacts and natural history specimens, live plants, and animals. Brooklyn's History Museum - Run by the Brooklyn Historical Society, it reopened October 2003 after four years of renovations. The National Historic Landmark building was originally built in 1881 by George Post as the Long Island Historical Society. Brookside Museum - one of the oldest buildings in the Village of Ballston Spa, NY. Cayuga Museum - The history of Auburn and Cayuga County housed in the Willard-Case mansion. Children's Museum of History, Natural History, Science, and Technology - Utica. Hands-on learning center with emphasis on local history, environmental science, the arts, and space science. The only children's museum in the country to be adopted by both NASA and the Office of Science. Cold Spring Harbor Whaling Museum The Cold Spring Harbor Whaling Museum collects, preserves, and exhibits objects and documents pertinent to whaling, especially the regional whaling history of Long Island, whale conservation, and the history of Cold Spring Harbor as a maritime port. Clermont State Park - was the Hudson River seat of New York's politically and socially prominent Livingston family who occupied this site for seven generations, web site maintained by the Friends of Clermont. Cradle of Aviation Museum - Nassau County's new Museum's at Mitchel Center is expected to be completed by the fall of 2000 to coincide with the 100th anniversary of the County. Crown Point State Historic Site - the abandoned French Fort St. Frederic was taken over by the British in 1759, the British began construction of "His Majesty's Fort of Crown Point." This fortification complex contributed to the British conquest of Canada, the last French stronghold, and control of Lake Champlain as a communication highway. Elbert Hubbard Roycroft Museum - information about Roycrofters and the Elbert Hubbard Roycroft Museum. Empire State Railway Museum (Phoenicia, NY) - preserving the history of the railroads that passed through the Catskills Mountains. Erie Canal Museum (Syracuse, NY) - founded in 1962, it is housed in the 1850 Weighlock Building, where canal boats were weighed during the days when they traveled through the center of Syracuse on the Erie Canal. Erie Canal Village (Rome, NY) - 1840-1860 era re-created Canal village is an outdoor living history museum located alongside a portion of the original Erie Canal. An 1840's horse-drawn packet boat provides rides on the historic canal section. Farmers Museum (Cooperstown, NY) - explore rural heritage and farming history. colonial government and the meeting place of the Stamp Act Congress which assembled in October, 1765, to protest "taxation without representation". The Continental Congress met at City Hall. Fort Edward - strategically important during its long and illustrious history because it commands the Hudson and Champlain Valleys. The Fort Edward Historical Association and the Old Fort House Museum are open to the public, P.O. Box 106 Fort Edward, NY 12828, Phone: (518) 747-9600. Fort Ticonderoga - museum and research center housed in 1755 French fort. Fort Tilden - established in 1917 and located on the Rockaway Peninsula in the Borough of Queens in New York City. Fort William Henry - excavations taking place July 17 to August 25, 2000 within the walls of Fort William Henry, site of the tragic Abnaki Massacre memorialized in James Fenimore Cooper’s novel "The Last of the Mohicans". Franklin County Historical and Museum Society - An elegant 1860s townhouse museum, featuring Victorian furnishings and early craft exhibits, plus a county-wide historical program that includes genealogy services for those with Franklin County family roots. Franklin D. Roosevelt National Historic Site - including information on special events, park facilities, FDR's life, and more. Fraunces Tavern Museum - dedicated to the study and interpretation of early American history and culture. Frederick Douglass Museum and Cultural Center - tells the story of Frederick Douglas, abolitionist, orator, writer, reformer, diplomat and statesman, and the people with whom Douglass lived and worked, and the contributions which they made to this country's history and the development of a free society. Genesee Country Village & Museum - it is a recreated village of 68 historic New York state structures dating from 1797 to 1884. It is the largest living history museum in the state and has the largest collection of historic structures in the Northeast. George Eastman House (Rochester, NY) - located on historic East Avenue in Rochester, this 12.5-acre museum site was the urban estate of George Eastman (1854-1932), founder of Eastman Kodak Company. Glenn Curtiss H. Museum of Early Aviation and Local History (Hammondsport, NY) - exhibits on Glenn Curtiss, aviation, the wine industry, and more. Gomez Mill House - five miles north of Newburgh, NY, on the Hudson River, is the oldest house on the National Register of Historic Places in Orange County and the earliest surviving Jewish residence in North America. It has been continuously inhabited for more than 280 years. Harriet Tubman Home - preserves the legacy of "The Moses of Her People" in the place where she lived and died in freedom. The Hart-Cluett Mansion (Troy, NY) - one of the finest intact houses of the late Federal period in America. Henry F. Johnson Museum of Art (Cornell, NY) - one of the most important university museums in the country. Hicksville Gregory Museum (Hicksville, NY) - features historical exhibits and specializes in the earth sciences. Hispanic Society of America - museum and reference library for the study of art, culture, and history of Spain, Portugal, Latin America, and the Philippines. Historic Hudson Valley - take a virtual tour of six Hudson Valley landmarks: Sunnyside, Philipsburg Manor, Kykuit, The Union Church of Pocantico Hills, Van Cortlandt Manor, and Montgomery Place. Historic Richmond Town - an authentic village, museum complex and archives, interpreting three centuries of daily life and culture on Staten Island. Many buildings have been restored and are open for touring. You will see furnished interiors, exhibits and demonstrations of daily activities of early New Yorkers. Horton Point Lighthouse and Nautical Museum (Southold, NY) - includes images and history of lighthouses. Also the official site for the Horton Point Lighthouse and Nautical Museum. House of Frankenstein Wax Museum (Lake George, NY) - visitors can find monsters roaming the halls, and frightening and educational wax exhibits set in a castle. Hudson River Maritime Museum (Kingston, NY) - dedicated to the preservation of the maritime history of the Hudson River. Hudson River Museum - cultural complex with galleries displaying changing exhibitions of art, history and science related to 19th and 20th c. topics. Hyde Collection Art Museum (Glens Falls, NY) - features exhibitions, lectures, family activities, concerts, educational programming, and other community-based events. Iroquois Indian Museum (Howes Cave, NY) - educates the public about the Iroquois by collecting exhibiting, and interpreting their arts and culture. Jewish Museum - captures 4000 years of history and culture. Junior Museum - fosters children's interest in science, history and the arts. Leo Baeck Institute-New York - research, study and lecture center, museum, library, and archives devoted to the history of German-speaking Jewry. Lower East Side Tenement Museum - Visitors to the Tenement Museum tour carefully restored tenement apartments and learn about the lives of actual past residents. Lucy-Desi Museum (Jamestown, NY) - tribute to the first couple of comedy, open only in the summer season. Marcella Sembrich Opera Museum (Bolton Landing, NY) - view memorabilia from her career in her original teaching studio, and walk along the Lake George shoreline on Sembrich Point. Mid-Hudson Children's Museum - hands-on exhibits and activity stations for 2-12 year olds. Performances, parties, tours, summer camp, traveling exhibits, and more. Montauk Lighthouse Museum (Montauk, NY) - packed with detailed historical information, pictures, sound, and video. Museum of American Financial History - offers online exhibits celebrating entrepreneurship, investment banking, and the capital markets. Museum Village (Monroe, NY) - living history museum for families, teachers, and students, with artifacts, barnyard animals, and exhibits. Museums of Long Island [liglobal] - local links to art, science, history, and collections. National Baseball Hall of Fame & Museum (Cooperstown, NY)- birthplace of baseball, home of Abner Doubleday field, where the annual Hall of Fame game is played, public tours of Hall of Fame and museum available. National Canal Museum - exhibits on the regional canal system that connected the area's anthracite coal mines and the two largest metropolitan areas of that time, New York and Philadelphia. National Racing Museum and Hall of Fame (Saratoga Springs, NY) - interprets the history and conveys the excitement of Thoroughbred racing in America. Natural History Museum of the Adirondacks - planned museum will be dedicated to the observation of the natural conditions of the Adirondack region. Neversink Valley Area Museum (Cuddebackville, NY) - history of the Neversink River Valley of Orange County. New Netherland Museum - operates the Half Moon, a reproduction of the ship that Henry Hudson sailed from Holland to the New World in 1609. New York City - museum links and other cultural institutions on the city of New York web site. New York City Police Museum - collection of objects, stories, and information exploring the history of the department. Northport Historical Society and Museum - The site includes museum events and programs, a "Kids' corner," teacher resources, a timeline, and other historical information on Northport and its environs, including East Northport, Fort Salonga, Asharoken, and Eatons Neck. NY Food Museum - New York City circa 1900. Farming, fishing, open-air markets, pushcarts, oyster barges, breweries, more. New York State Museum (Albany, NY) - New York State history, culture, and environment, a program of the State Education Department..
NYS Urban Cultural Parks and Visitor Centers - Heritage Areas of New York State. Old Fort Niagara - not your average State Historic Site website. Old Bethpage Village Restoration (Old Bethpage, NY) - Long Island's rural heritage on 100 acres with historic homes and workshops. Pedaling History Bicycle Museum (Orchard Park, NY) - the largest all-bicycle museum in the world, and exhibits a complete history of the innovation, invention and development of man's first personal mechanical transportation. Koscuisko are still evident. Headquarters of the Bureau of Historic Sites and Bureau of Historic Preservation Field Services are located here. Postmodernism and Art History - gallery and museum reviews from New York City, by John Haber. Proctor's Theater (Schenectady, NY) - historic theater opened in 1912, listed on the National Register of Historic Places, run by The Arts Center & Theatre of Schenectady (ACTS). Raynham Hall Historic House Museum (Oyster Bay, NY) - historic home on the north shore of Long Island, revealing life from the American Revolution to the beginning of the Gold Coast. Research Web - research site for the largest non-profit natural history museum in the United States. Saratoga National Historical Battlefield (Saratoga, NY) - comprises three separate units, the 4 square mile Battlefield in Stillwater, New York, the General Philip Schuyler House eight miles north in Schuylerville and the Saratoga Monument in the nearby village of Victory. Schenectady Museum (Schenectady, NY) - history and science exhibits, planetarium and hands on activities for children. Schuyler Mansion (Albany, NY) - Completed in 1763, Philip Schuyler (1733-1804), a descendant of Albany's earliest settlers, chose an 80-acre parcel of farmland just south of the city of Albany as the site for his home. Slate Valley Museum (Granville, NY) - exhibits dedicated to the history and culture of the slate industry. Photographs, videos, local arts, and tours of working quarries are featured. Sodus Bay Lighthouse & Museum - located at Lake Ontario and the entrance to Sodus Bay. South Street Seaport Museum - contains square-rigged tall ships, schooners and maritime exhibits and galleries. Provides maritime history, entertainment and education. Southold Indian Museum - dedicated to the cultural history of the Indians of Long Island, and a chapter of the New York State Archaeological Association. Strong Museum - a hands-on history center for children and families. Learn about the museum and try some activities from our exhibitions. Susan B. Anthony House - information about the museum, a virtual tour, and links to Suffrage history resources. Toy Town Museum (East Aurora, NY) - guided tours give insight into the history of toys and how manufacturing, materials, inventions and World events influenced the children's toys. Vanderbilt Museum and Planetarium - natural history museum and planetarium. Walt Whitman's Birthplace (Huntington Station, NY) - guided tours available. Yasgur Road Productions (Bethel, NY) - The original Woodstock festival took place on 40 acres in Bethel, NY in 1969 and hosts an annual reunion to commemorate the Woodstock spirit of peace, love and music. Zadock Pratt Museum (Prattsville, NY) - exhibits, museum events, lodging and shopping guide, and more.